This weekend in Carlisle, the Carlisle Theatre will present a Holiday Celebration which will include performances by St. Paul's Brass and The Dickinson College Octals. Following those performances, a favorite Christmas movie, "White Christmas" will be shown! The Irving Berlin musical movie is best seen on the BIG screen! The cost for the evening of entertainment is only $7 per person. At the Cumberland County Historical Society, you can get into the Christmas spirit the Civil War way with a special exhibit. If you visit the Historical Society on Saturday, December 8th, admission is FREE! Civil War era Christmas displays and information don't get any better than that! As you think about Christmas gifts for family and friends, remember to visit our gift shop or purchase a gift certificate toward a stay at Pheasant Field B&B. The "ahhhhh experience" of a getaway to Carlisle, PA will be their favorite Christmas gift! Countdown to Cabin Fever - only 25 days until you can take advantage of this January-only special: Buy one night, get the second consecutive night FREE. Make your reservation now for a January getaway! Watch for our December newsletter in your email inbox. 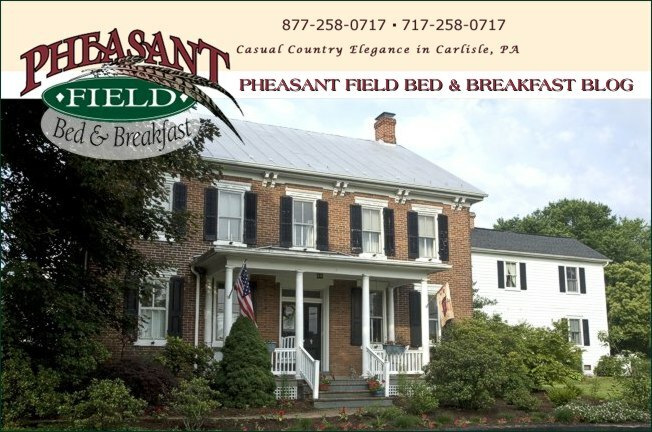 If you are not on our mailing list, sign-up for Pheasant Field B&B emails.